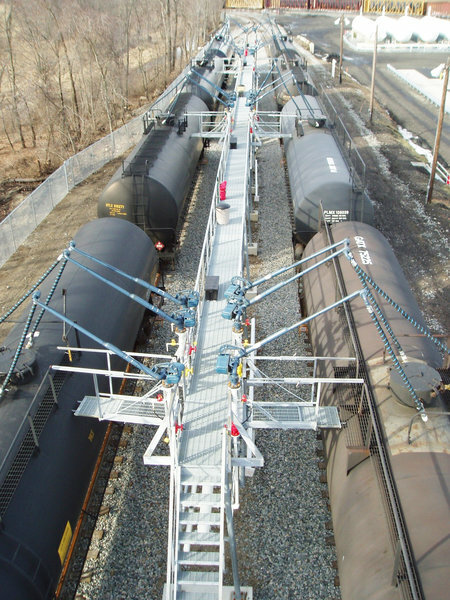 Arm-Tex provides expert railcar loading solutions from OPW Engineered Systems and Liquip. Commonly used to handle high flow rates railcar loading and unloading arms have longer reach and greater support than truck loading arms. Top loading and unloading arms for railcar applications are available to “splash” load or can be fitted with vapor recovery hoses and hatch covers, Civacon level and ground monitoring, and any type of valve, safety breakaway fitting, dry disconnect connections or wing union or cam and groove connections. Bottom loading and unloading arms for railcar applications come with a large variety of under rail car connections that make it easier on the operator to connect and monitor the flow process with the highest regard for safety and leak free operation. Special crude oil rail car and liquid gas arm designs available. Contact Arm-Tex today for more information on our top loading arms for your project or for parts or technical manuals to repair an arm still in service.